I Make Cheese: Manchego Tasting! We couldn't contain ourselves any longer, and simply HAD to taste our Manchego! It's been aging for three weeks. Doing a "blind" taste test (see above photo), we could definitely taste a difference--but they were still strikingly similar. The most notable differences were the age (ours, at three weeks, is much less mature, less robust) and the type of milk. When compared side-by-side, we could definitely taste the difference of the cow's milk vs. the sheep's milk, particularly in the aftertaste. 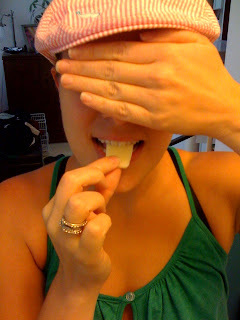 Overall, however, ours really did taste like Manchego! It had good texture, was somewhat creamy, and maybe a little drier than the one from Spain. * We also "settled" on some Quince Paste to go with the Manchego. It was a tough call between the Quince Paste and the Fig Spread, but cooler heads prevailed. MMMmmmm! Where's Hear No and Speak No!? Yeah, I don't know that I can wait 11 months ... but maybe 2 or 3. When do we taste the cheddar?? Last month's cheddar will be ready in another month (or if we can wait longer, it should be even tastier). The Horseradish and Jalapeno cheddar won't be ready until mid-August, at the earliest... Patience, my friends, patience! ...a month is nearly up! Where's the cheddar!? More cheese, much more cheese! Patience my friend, patience! July 20 is the date for the stirred-curd cheddar. I just found your blog, searching for Manchego. I made some a few days ago & it's still drying. I can't decide if I should wax it, leave it in my "cave" (aka the canning part of the basement) or rub it with oil/cocoa/pepper. I heard some people age their cheeses this way..and googled..and here I am! I'm hoping my Manchego will turn out half as good as yours apparently has!